Mocha Muffins let us enjoy both the flavors of coffee and chocolate. They have a moist and tender crumb and are full of chopped nuts and chocolate chips (can use cappuccino chips, dark, white, or even milk flavored chips). Perfect anytime of the day. Muffins are what we call a "quick" bread and you can see why when you make this recipe. All you need are two bowls; one for the wet ingredients, and one for the dry. Combine the two and the batter is made. A few notes on ingredients. These muffins do not contain butter, instead the fat is in liquid form, and using oil instead of butter makes the muffins wonderfully moist and tender because oil prevents the development of gluten in the flour. You can use any flavorless oil - canola, corn, vegetable, safflower, or even a light olive oil. Buttermilk is also used and it has a nice thick creamy texture with a rich tangy buttery taste that makes baked goods tender. You can buy the buttermilk or make your own by stirring 1/2 tablespoon of white distilled vinegar, cider vinegar, or lemon juice into 1/2 cup (120 ml) of milk (whole or reduced fat) and letting it stand 5 to 10 minutes before using. Another choice is buttermilk powder. The coffee flavor in these muffins comes from adding 1/4 cup (60ml) room temperature black coffee or espresso. You could also use 1/4 cup water and 1/2 - 1 teaspoon of instant coffee or espresso powder. And if you do not want a coffee flavor you could just use 1/4 cup water. 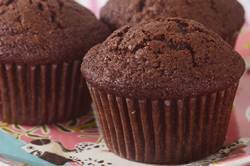 These Mocha Muffins contain both all purpose (plain) flour and whole wheat flour. The whole wheat flour adds both taste and texture to these muffins. If you are unfamiliar with whole wheat flour it is flour that is milled from the entire whole wheat berry, so it still contains its bran (fiber) and its germ (rich in oil, protein, iron and vitamins). This makes it rich in fiber and it also has a nutty toasted flavor. If you do not want to use whole wheat flour you can simply replace it with an equal amount of all purpose flour. Lastly, it is hard to tell when chocolate muffins are baked and we definitely do not want to over bake them or they will be dry. So check them towards the end of baking and they are done when they are firm to the touch and a toothpick inserted in the center of a muffin comes out clean. Mocha Muffins: Preheat oven to 375 degrees F (190 degrees C). Place oven rack in center of oven. Line 12 muffin cups with paper liners, or butter or spray with a non stick cooking spray. In a large bowl whisk together the eggs, buttermilk, oil, coffee, and vanilla extract. Evenly fill the muffin cups with the batter, using two spoons or an ice cream scoop. Place in the oven and bake until a toothpick inserted in the center of a muffin comes out clean, about 18 - 23 minutes. Transfer to a wire rack and let cool for about 5-10 minutes before removing from pan. Can be stored at room temperature for a few days or they can be frozen.